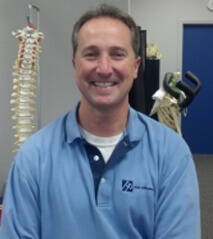 Darrin has been a therapist for 25 years and has worked at both the high school and college level in the athletic medicine departments. He traveled with the Pepperdine Men’s volleyball team in 1990 under 1988 gold medal coach Marv Dunphy. Prior to coming to North Carolina in 2011, and after Darrin helped Tenet’s Fountain Valley Hospital achieve a perfect 100% with accommodation as supervisor for the outpatient rehabilitation department Darrin opened, owned and operated Balanced Health, Inc. Sports medicine for 13 years. You will find his energy, empathy and quest for knowledge encouraging and motivating. Having worked in environments from high caliber sports to rest homes, I believe I have gained valuable experience in treating all types of patients and clients. There are no cookie cutter solutions. My background allows me to integrate all I know about the body to custom design a specific fitness, rehabilitation, or sports program for each individual. Darrin is the proud husband of Brenda and father of three boys and one girl.